Hatters’ 3-0 defeat to Coventry City at the weekend is by no way a disaster according to boss Nathan Jones. Town were beaten for the first time in almost two months by the Sky Blues, as their nine game unbeaten run was ended, while they slipped off the top of the table in the process, dropping to third. It’s been a decent month, it’s been a poor day today, but we’re in a decent position, so lets concentrate on that. However, Jones said: “On the whole we’ve got 10 points from the month, it’s five points, two points a game, we’re still third so it’s not a disaster. “It’s been a decent month, it’s been a poor day today, but we’re in a decent position, so lets concentrate on that. “They asked to be in the top three with 10 points, so we’ve done that this month, it just seems a little bit disappointing considering we had the first three games of the month where we’ve won and then to go and lose our home game, but we did that against Swindon here. “We lost 3-0 after having a man sent off and then we went on a nine game unbeaten run so that’s basically what we’ll try to do now. 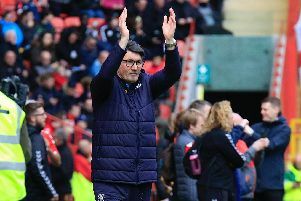 Trailing 1-0 to Marc McNulty’s first half header, Luton threw captain Scott Cuthbert upfront as they had against Wycombe last month, but it didn’t work this time, with Coventry adding two goals in stoppage time after Glen Rea was sent off. Jones continued: “We’re trying to chase it, we put Scott Cuthbert upfront, we just got caught on the counter attack for the last two goals. “It was a good free kick, now maybe in hindsight if we had said we won’t try anything different to try to get the goal to draw the game, we’ll just lose 1-0, we could have done that. “But we tried to get back in the game and they’ve scored two late, it looks convincing and puts that flattering edge on the scoreline. “Lets give them credit, they’ve come and put a good away performance in and won the game. “We wanted to get the point. You look back on things, if we’d come here, been solid and secure and then said, they don’t score many goals, we could have done that and played like an away side, that would have been something, but that’s not how we play. Hatters now face a break from league action as they travel to AFC Wimbledon in the Checkatrade Trophy tomorrow evening and then switch their attentions to the FA Cup, hosting League One Portsmouth on Saturday. Jones added: “I don’t it’s come at a bad time, we can’t pick and chose, but it will give us time to regroup, get everyone up to speed. “We’ll go to Cheltenham, hopefully with a full squad, with everyone up to speed and Alan McCormack will be closer to playing, Andrew Shinnie’s had minutes, he’ll have had more minutes this week.